The two butterflies fluttered across the Firth of Forth, an estuary that opens to the sea near Edinburgh. "Look at the bridges," Bruce said. "I like the Forth Rail Bridge. Look at the orangish rails and poles. They’re thick and strong and that’s good when trains go over it. I think it’s an interesting design." "But its good that they opened the Forth Road Bridge, so that cars could cross from one side to the other," Bonnie said, glancing down at the cars crossing the busy bridge. Her mind wandered. "Remind me again, Bruce. Why are we going to Pittenweem?" "It’s very picturesque. I thought you’d enjoy it there. People come from all over the world to visit. There are a lot of painters and photographers who go there to try to capture the magic of the town," Bruce said. "Maybe someone will paint our picture," Bonnie chuckled. "And besides all that, they’ve got beautiful flowers there, including your favorite," Bruce teased. "My favorite? You mean….you mean….there are gladiolas?" Bonnie asked. "Yes. One of my pals told me that the best gladiolas he’d ever tasted grew in Pittenweem, though mostly in the folks back gardens," Bruce said. "I can’t wait," Bonnie smiled. She flapped her wings harder. "Let’s hurry. I’m hungry." After a while they arrived at the town. "Look at all the fish restaurants and hotels!" Bruce cried. "They’re painted very colorful, aren’t they? There’s a pink one, a blue one, a yellow one and purple one. I’ve never seen such unusual colored buildings." "They’re very pretty and there are the photographers. Look over there, near the boats. There are several and see the people painting?" Bonnie said, excitedly. "How wonderful it would be to be painted; but enough of that. Let’s find those gladiolas." They fluttered from house to house, looking in each back garden. There were pink roses and dark purple violets and white daisies with bright sunshine-yellow centers in almost every garden. "There are some gladiolas," Bruce pointed. They flew down to them. "Isn’t this beautiful?" Bonnie asked, not needing an answer. "It’s lovely." She put her proboscis into one of the flowers. "Mmmm, delicious!" she sighed, sipping the sweet nectar out of the flower. Bruce landed on a rosebush and ate. "Say, Bruce, what’s in this town to see other than buildings?" Bruce lifted his head. "There’s a cave. If I remember correctly, a long time ago some monks cut some stairs, leading from the cave to the church above. We could see that? I hear there are some flower gardens there?" "We can go and see. I’m not too fond of caves though," Bonnie said. "What else?" "Just east of here is a windmill. There used to be quite a salt trade here and the windmill carried the water in. It’s quite nice to see," Bruce replied. "A windmill? How fun!" Bonnie said. After they’d finished eating, the butterflies fluttered off towards the cave. "Just a minute, Bruce. I see some pretty hyacinths growing. Let me go and have a nibble and then we’ll be on our way." They landed on the purple flowers and began sipping. Just then a woman walked by. She saw the butterflies. "Oh, how lovely," she said. She put her chair down and set up her easel and canvas. "I think I’ll paint those two butterflies. They’re just beautiful and blend so well with the hyacinth." "Did you hear that?" Bonnie said. "She wants to paint us. We’ll have to stay here now, until she’s finished." "But what about the cave?" Bruce whined. "And what about the windmill?" "Bruce, stop complaining. You know how I’ve always wanted to be painted. Now sit there and sip the nectar and stop whining!" Bonnie demanded. The butterflies sat on the flowers for hours. Even Bonnie tired of it. "Yawn! I’m totally fed up. Painting or no painting, let’s get out of here," Bonnie said. "Thank goodness!" Bruce answered and the two flew off. "Come back, little butterflies," the woman called, "I can’t finish my painting without you." Bonnie and Bruce kept on flying. "Let’s have a quick look at the cave and the garden and then we’ll head for the windmill for the night," Bonnie suggested. They did just that. 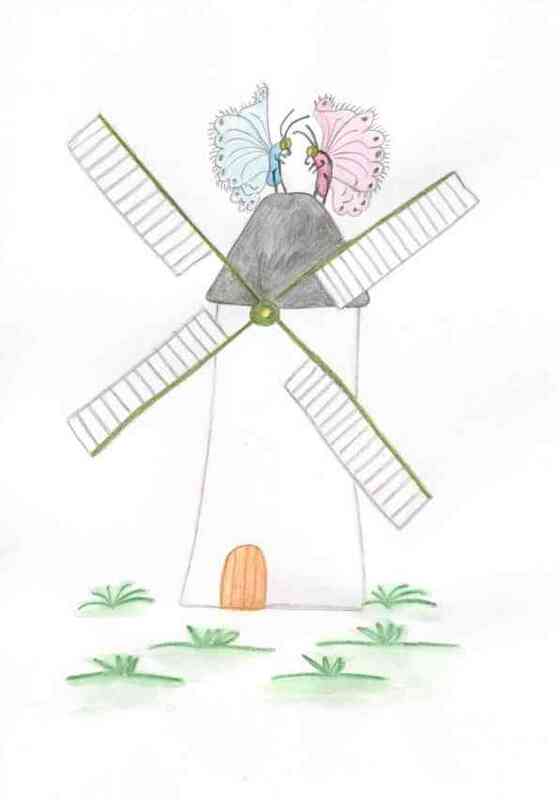 When they reached the windmill, there wasn’t even a breeze blowing in from the sea. There were no seagulls or any other signs of danger. Before she fell asleep, Bonnie said grumpily, "The next time I suggest letting someone paint our portraits, remind me of this day! YAWN! Good night, Bruce." "Good night, Bonnie," Bruce answered and closed his eyes.